A successful biodiversity project is helping brighten up areas of North Tyneside with colourful wildflower displays. Poppies, marigolds, cornflowers, birdsfoot trefoil and many other varieties of plants have flourished after North Tyneside Council created wildflower meadows earlier in the year. It was part of the ‘Alan Challenge’, introduced by gardener Alan Titchmarsh to increase Britain’s wildflowers, plants and wildlife. Seeds were sown in selected sites, including around trees, by-passes, roadside verges and fields, and some grassy areas were cut back less often. And now the biodiversity areas have blossomed, creating the perfect habitat for butterflies, bees, birds and small animals. 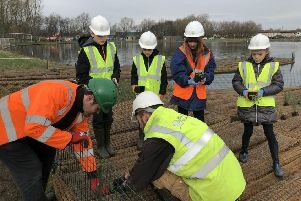 Coun John Stirling, cabinet member for environment, said: “I am thrilled with the project – the borough is looking absolutely wonderful, residents are really pleased, too. “As well as it bringing a splash of colour to the borough, the benefit for the environment is huge. To manage the wildflower areas and ensure they flower again next spring, the areas will be cut back in early autumn. A perennial and annual wildflower mix was sown this year, which the council anticipates will mean more wildflowers flourishing next year.